There're plenty of things that can threaten to ruin your subway ride -- the smell, inconsiderate manspreaders, mysterious stains, but imagine dealing with those usual problems, and add a crowded dance club. As illustrated by a YouTube video posted by AMK Productions, a group decided to do just that and "warm things up" on the the 1 Train by throwing a "DJ Dance Party." The operation seems pretty put together, with a DJ and his Mac and turntables, flashing strobe lights, and even a bouncer working the door behind a red velvet rope. 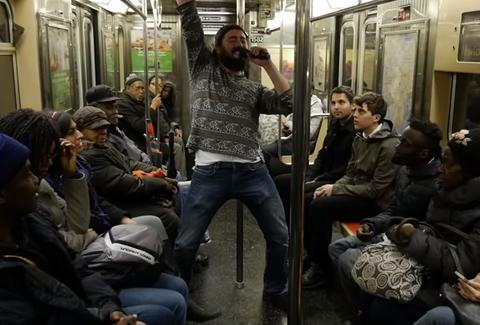 Much of the video portrays amusement from the commuters, as the crowd appears to be smiling and genuinely appreciative, with some of them even joining in on the dance-dance action. Fun, right?! Well, maybe. If you're a glass half full kind of person, maybe an unexpected techno thrill on your commute is just what you need to reassure yourself that this city is indeed full of unexpected wonderment. Or, more likely, if you're trying to mind your own business and get where you're going in peace, this could be the final push you needed to fully commit to Uber. Or a bike. The group states at the start of the video that riding the NYC subway is like "walking into a freezer," because "it's cold, people don't engage with each other, and we often avoid even making eye contact with others," so they threw a train party to solve all that. But is there anyone out there who's actively trying to strike up a meaningful conversation in the smelly, crowded confines of a dirty, underground train car and getting super frustrated when they get rebuffed by the icy demeanor of the other commuters? Well, again, maybe. It probably comes down to just how jaded you are. But regardless of whether you're pro subway dance party or not, it looks like these guys were able to put smiles on a few faces IN A NEW YORK CITY SUBWAY CAR, and that's an admirable feat in itself. Pete Dombrosky is an Editorial Assistant at Thrillist and he wouldn't ride the subway another day of his life if he didn't have to. Check out more of his subway hot takes on Twitter.